Péladan’s Prométhéide was written in 1893 and published in 1895. In the Preface of the trilogy Péladan had quoted a letter of Émile Burnouf, a famous French scholar of ancient Greek literature, in which the latter testified that the play was philologically correct. Burnouf proclaimed his certainty that Aeschylus’s work was an esoteric introduction to mysteries, a mystical ritual which main goal was the revelation of religious truth to the public. As it is known, only one of the three Aeschylus’ tragedies on the Titan is left, Prometheus Unbound. Péladan pretended to have ‘restored’ the two lost tragedies, the Fire Thief and Prometheus released, and to have translated the only one we do have. Yet his interpretation of Aeschylus’ work is an esoteric one, in which he tries to balance the values of ancient Greek culture and the Christian Revelation: Péladan’s Prometheus is the creator and savior of humankind, the precursor of Christ. Prometheus’ sacrifice is interpreted by Péladan as an anticipation of Christ’s suffering for the salvation of mankind, as his Aeschylus ‘translation’ demonstrates: the Greek Prometheus suffers ‘for the destiny of his brothers’, while Péladan’s hero suffers ‘in his brothers’. His suffering is, furthermore, a ‘suffering for justice’, an expression that concludes the three Péladan’s tragedies and exhibits the deep sense of his work. 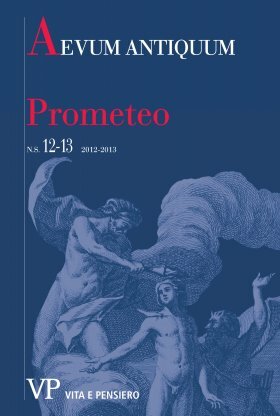 His Prometheus is moreover a Symbolist character, without a realistic personality and without a real risk of dramatic conflict: an absolute character, indeed.